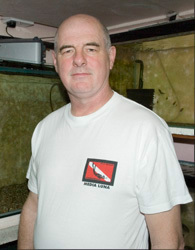 Richard Robinson started by just having two fish tanks at home, then the bug started to kick in with the want of more tanks. It all developed into a fish house where he has 13 tanks with almost all Central American cichlids, his passion, he has kept cichlids for more than 25 years. Richard has travelled to Mexico to see these beautiful fishes in there natural habitat, which is a dream come true for him. Richard has travelled to America twice in the last two years to meet with other cichlid addicts world wide and people with the same dreams as himself, with cichlids also comes a special place for very good friends. Richard is also planning to go back to Mexico to see more of the wonderful fishes, and more habitats.